Daniel and I played hookey from school and work and made it up to the mountain in plenty of time to pick up our passes and boot up for the 10am opening. Whether you're 14 or 55, nothing's more exciting than the first sight of snow up on the mountain. Early season operations at Killington are a bit different from most mountains. All the skiing takes place on upper mountain trails, accessed by the K1 Gondola and the Catwalk footbridge. The combination of high elevation and snowmaking firepower allows crews to crank out lots of snow quickly, and that's exactly what they did as soon as temperatures dipped earlier this week. By the time you reach the end of the hike across the Catwalk footbridge, you've arrived in a different world. Without a doubt we had stepped out of fall and into winter. Coverage was excellent with nice edgeable snow that you'd be happy to ski in February. As temperatures warmed during the day, surfaces transitioned to softer spring-like conditions, especially on the lower half of the open trails. Despite the early date, there were no bare patches, gravel, mud or ice that typify many of the early season days I've skied. You couldn't ask for a nicer opening day. With the great conditions, beautiful weather and free lunch that Killington offered to passholders, the enthusiasm level stayed high all day. Far from typical one-and-done days, skiers were logging laps by the dozen. I figured I must have gotten close to 20 laps in, Daniel and his buddy were north of two dozen and one guy I hiked back up the Catwalk with at the end of the day had logged more than 30 laps in an attempt to shock his 55-year-old legs (same age as me) into shape for the season. We'll take the next couple weekends one at a time. If there looks to be good skiing and good weather, we'll log a few more early season days. I know Beth and Sylvie are itching to get out now that Daniel and I have gotten our first day. I haven't figured out yet exactly how I'm going to keep the blog updated this year. I took a break from blogging over the summer, and for a while considered making that a permanent break. Blogs have for the most part been replaced by other forms of social media, and sometimes it feels like I'm blogging for an audience of 1. My job is busier these days, which leaves less time for blogging. 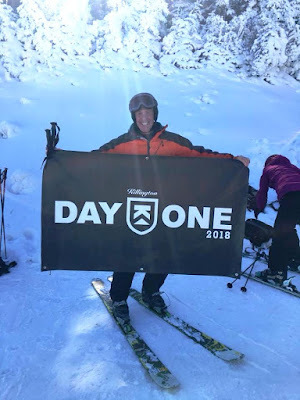 I'm not quite ready to give up the blog entirely, but suspect I'll go with a strategy of posting an update when it feels right, rather than attempting to document every ski day. I may use my Facebook page to post photos and a brief update in between regular blog posts. We'll see. I go back and forth on blogging. I think my blog is ten years old now - a dinosaur. Yet, when I've threatened to pull the plug, I've gotten requests to keep it going. These days, I use it to keep people up to date on my health. T might be depressing to read, but I consistently have readers. I'm sure you have more readers than you realize. Glad you got to get out there! I'm heading over there Thursday.